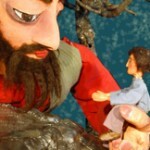 Founded in 2001 by Artistic Director Rob Ashman, Sea Legs Puppet Theatre is a high quality small touring puppet theatre. Performances take place in theatres, schools and at children’s events nationwide. DVD’s and audio CD’s of our popular puppet shows are now for sale in our online shop.